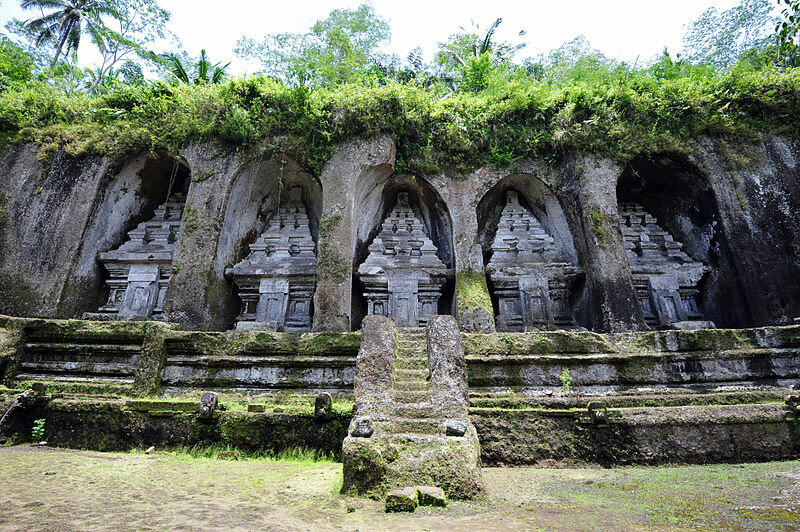 Gunung Kawi is an 11th-century temple and funerary complex in Tampaksiring north east of Ubud in Bali, Indonesia., that is spread across either side of the Pakerisan river. Legends relate that the whole group of memorials was carved out of the rock face in one hard-working night by the mighty fingernails of Kebo Iwa. It comprises 10 rock-cut candi (shrines) that are carved into some 7-metre-high (23 ft) sheltered niches of the sheer cliff face. These funeral monuments are thought to be dedicated to King Anak Wungsu of the Udayana dynasty and his favourite queens. On the east side there are five temples that are dedicated, according to one theory, to King Udayana, his queen Mahendradatta, and their sons Airlanga, Anak Wungsu, and Marakata. The temples on the west side are dedicated, according to the same theory, to the king’s minor queens or concubines.